If you want to shop less and still love your wardrobe, you have to learn to shop with intention. It wasn’t that long ago that I shopped just to shop. I had a closet full of clothes, but nothing to wear. This is true for a lot of us, because we don’t curate our wardrobe. We don’t think about what colors, style and fit work best. We also don’t shop with a purpose. This causes us to bring home stand-alone pieces instead of having a wardrobe that works together in a coordinated way. 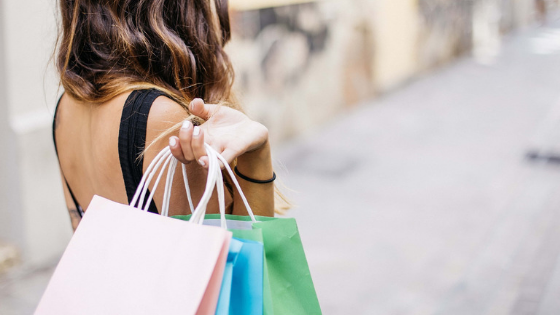 Read on to learn how to shop less, save more and still love your wardrobe. First and foremost, you have to know what you’re looking for. 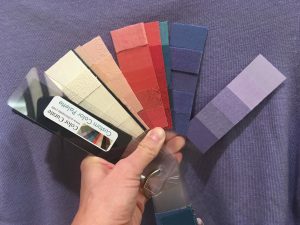 Know what colors, fit and style work best for you. Having a personal color analysis is key to this and can even be done virtually. 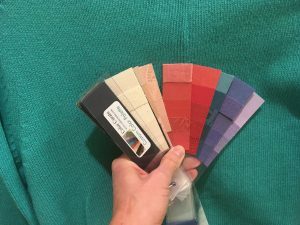 If you don’t have the ability to work with a consultant, then do some research on your own and try using a wardrobe app to keep track of what is and isn’t working for you (This post talks about a super easy wardrobe app that can help). Secondly, know how you want to feel and be perceived in your clothes. Having a two-word style statement, helps you determine whether new clothes fit with the image you want to project. My style statement is “Approachable Elegance with occasional hints of chic, sporty, or flirty.” Follow my 7 Steps to Developing a Style Statement to identify the words that best describe your personal style. Finally, make a list of what you actually need to complete your wardrobe, so that you’re buying with purpose rather than on a whim. Use your information and your phone to guide you while at the store. 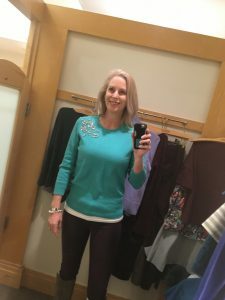 I recently went to Talbots to return some items. Since I had a few things on my shopping list – brightly colored sweater and a printed top – I thought I’d look around. I was very excited to see some nice, bright sweaters in fitted styles as bulky is so not my friend! My handy custom color fan helped me easily figure out what worked and what didn’t. I held my fan up to the two sweaters. The purple was pretty right on, while the bright green made my reds look more orange and dulled my bright colors. It wasn’t crazy far off though, and I thought it was super cute, so I tried it on, along with the purple sweater, and took a picture. Unfortunately, the super cute green sweater was just too bright for me. Once I took a picture, I could see that my eyes are immediately drawn to the sweater and not my face – it’s almost hard to look away from it! Whereas, the purple sweater is the perfect level of brightness for me as my eyes are drawn to my face. The photo is key, because this is much harder to see looking in the mirror as we always look at the shirt. Although I thought the color of the purple sweater was great, I didn’t like the cut on my body. 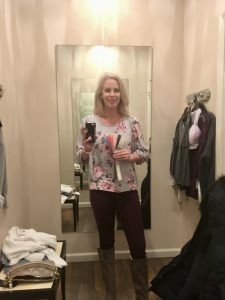 My motto is, “Hesitate means wait.” I walked out of Talbots happily empty-handed knowing that I didn’t waste my money on something I wasn’t going to wear anyway. As I walked out of Talbots, I noticed a cute little boutique next door, so I popped in there. All of their sweaters were too boxy, but I did find a printed top that I thought might work. As you can see from the picture, it worked with my fan. Since I’ve been looking for a print I like for a long time, I decided to buy it. Do not hang your item in your closet until you have reassessed it. Lighting and judgment in stores can truly get the best of you. Once you get home, you need to make sure the color is right and you can pair it with multiple things in your wardrobe. My new printed blouse paired with my plum jeans and taupe booties was a win for me. I also paired it with my blush color capris and sandals, my white jeans and sandals, and then with regular jeans and cranberry flats or booties. Lastly, I paired it with a pink cardigan and cream or navy slacks. 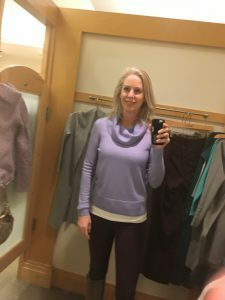 I like it, can pair it with six different items I already own in my closet, and can make outfits that work for late spring to early fall – I am keeping it! This print blouse may be a reject for you, but it’s very Spring. I find prints to be very season specific – you love or hate a particular print based on your season (post about prints by season). What are your favorite type of prints to wear, if any? I’d love to hear about them in the comments.